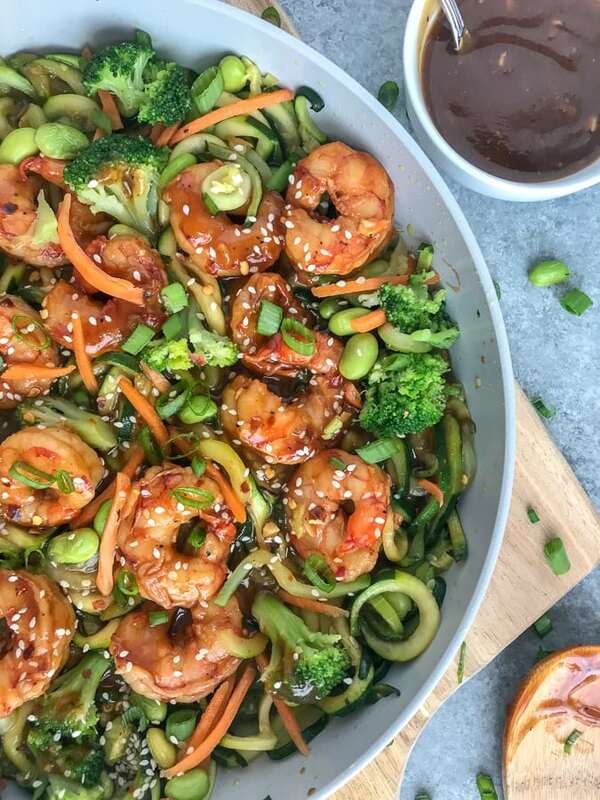 Simple Teriyaki Shrimp over Zucchini Noodles – this healthy recipe is made with a homemade teriyaki sauce and served over spiralized zucchini. Making for an incredibly delicious, easy, and low-carb dinner option that can be on your table in 30 minutes! Only 376 calories per large serving! I mean… look at those shrimp! 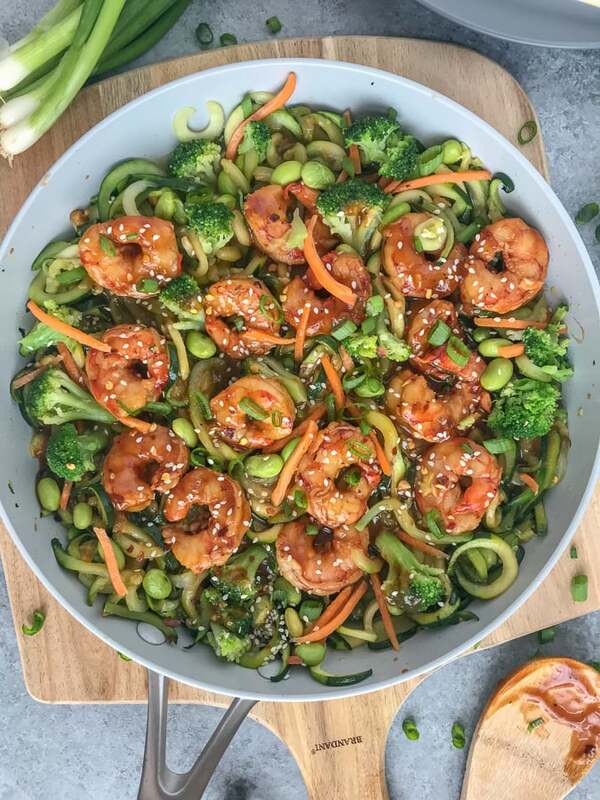 Huge, delicious, perfectly cooked shrimp sitting atop a bed of teriyaki zoodles! In case you don’t know what zoodles are – they are spiralized zucchini that are a wonderful, low-carb replacement to regular noodles. I can’t tell you how thrilled I am to have seen the rave reviews on my Grilled Chicken Cauliflower Alfredo with Zucchini Noodles from you guys! I have loved seeing all of your emails, comments on my Instagram Post, and your direct messages! If you’re not a fan of zucchini noodles, you are more than welcome to substitute this for regular noodles of choice. In fact, being the carb lover that I am – I insist! This recipe received rave reviews from my husband, Rob. He was impressed with how light of a meal it was, but also filling at the same time. Which was perfect for me because he was getting leftovers for his lunch the next day. Win win! Right? 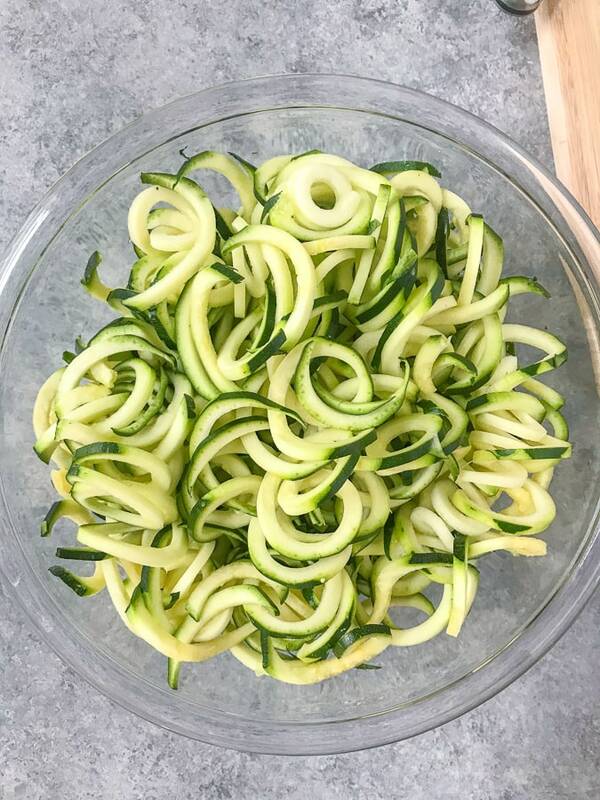 I prefer to spiralize my zucchini into thicker strands (or noodles), as I find that it helps keep them from shrinking too much or becoming too mushy once they’re cooked. But this is my preference. How did I get these perfect zoodles you may be asking?? EASY! With this wonderful gadget! Any lovers of my zoodle recipes have seen this beauty before. Why? Because it’s that freaking fantastic. Best little gadget I have in my kitchen. 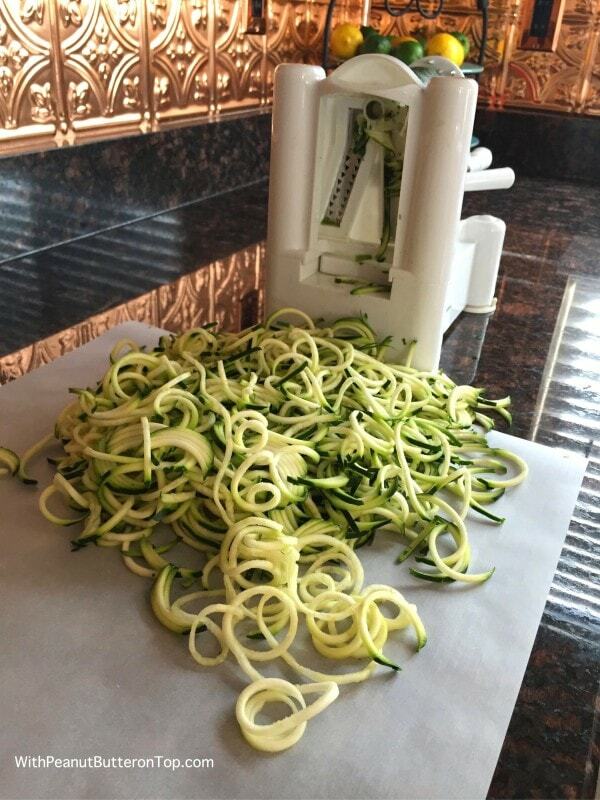 for all of my spiralizing. I have had it for over two years now and have absolutely no complaints. It’s very easy to use, suction cups to your counter for stability, and it cleans up very nicely. I have made my own curly fries with this, sliced an onion into perfect thin strips, and I make zucchini noodles with it all the time. Look at that bowl of delicious goodness! Trust me – you’re going to want to make this! Get wild caught pink shrimp. Trust me. Do not sacrifice flavor with anything farm-raised. The shrimp is the star of the show in this recipe! Keep the zoodles on the thicker side if you don’t want to end up with mushy noodles. What’s wonderful about recipes like this is that they are to your taste when it comes to the salty and sweet factor. Add as much sweetness or saltiness as your taste buds prefer. 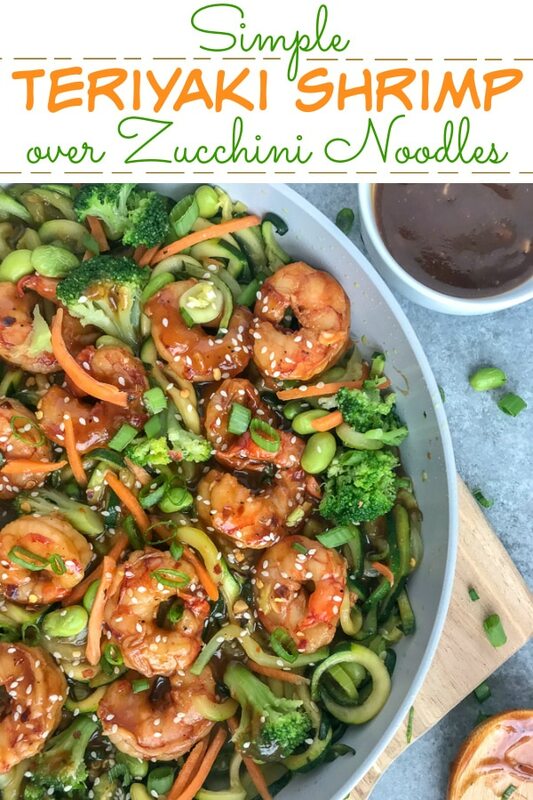 Simple Teriyaki Shrimp over Zucchini Noodles - this recipe is made with a homemade teriyaki sauce and served over zucchini noodles. Making for an easy, healthy and extremely delicious dinner option that can be on your table in 30 minutes! Whisk together ingredients for the sauce (minus the cornstarch) into a medium-sized bowl. To a small bowl, add the shrimp and 3 tablespoons of the sauce. Cover, place into the fridge and allow to marinate for approximately 10-15 minutes. 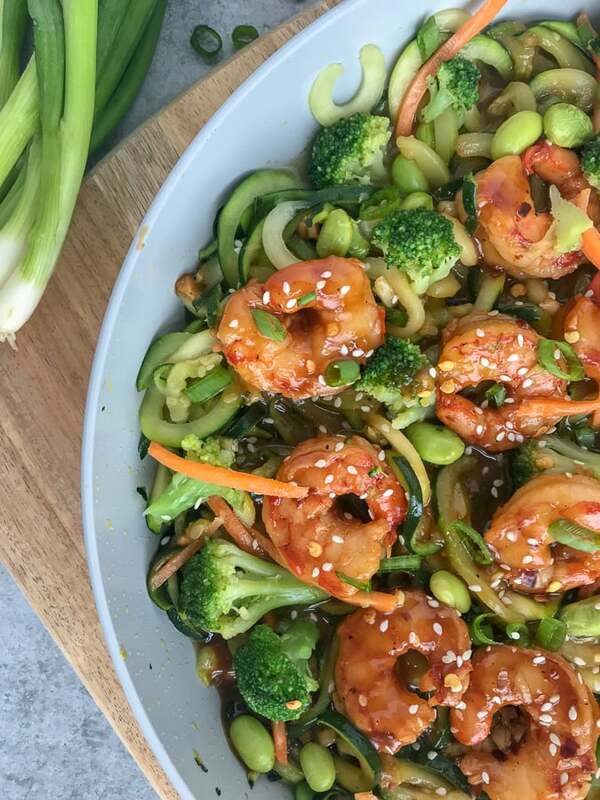 While your shrimp is marinating, you can either steam the broccoli or spiralize the zucchini. Heat a large, nonstick skillet with sesame oil over medium heat. Once heated, add the shrimp and allow to cook 3-4 minutes or until shrimp pinks up. Remove from pan, add to a bowl and cover with tented foil to keep warm. Into the same skillet add the sauce over medium heat. Allow it to come to a light boil. Slowly add the cornstarch 1 teaspoon at a time, whisking continuously to blend. Lower the temperature to a simmer and continue whisking for approximately 1-2 minutes while the sauce continues to thicken. Raise the temperature to medium-heat, add the zoodles and carrots. Toss with tongs to coat thoroughly. Allow to cook for 5-7 minutes or until the zoodles have softened, but are still tender. Time will be dependent on how firm you want your zoodles. Be cautious not to good too long! 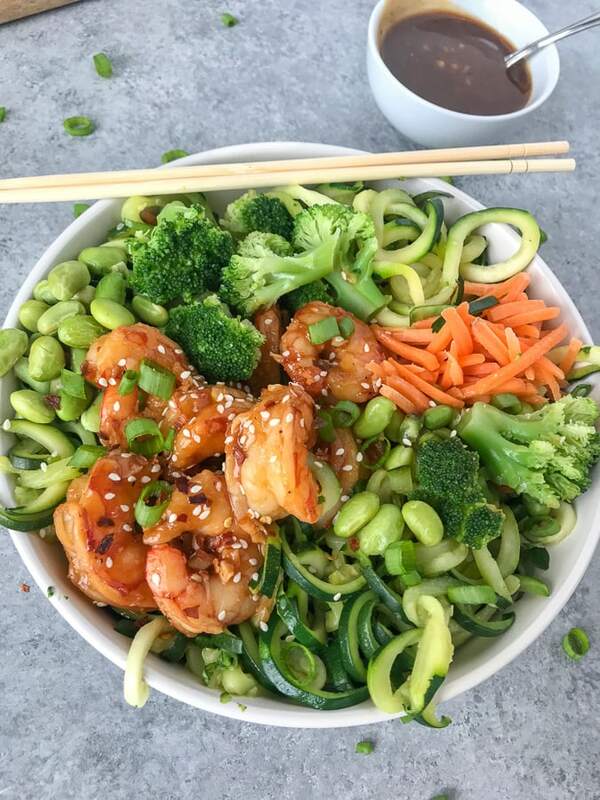 Add in the shrimp, broccoli, and edamame. Stir well to coat. Garnish with chopped green onions, sesame seeds, a dash of salt and upper, and some red pepper flakes. All optional. Keep the zoodles on the thicker side if you don't want to end up with mushy noodles. What's wonderful about recipes like this is that they are to your taste when it comes to the salty and sweet factor. Add as much sweetness or saltiness as your taste buds prefer.